Recently, one of my pairs of jeans went “rrrrip!” at the right knee. It happened around when I was preparing my previous post, on DIY Hot-fix Rhinestone Pattern Making. 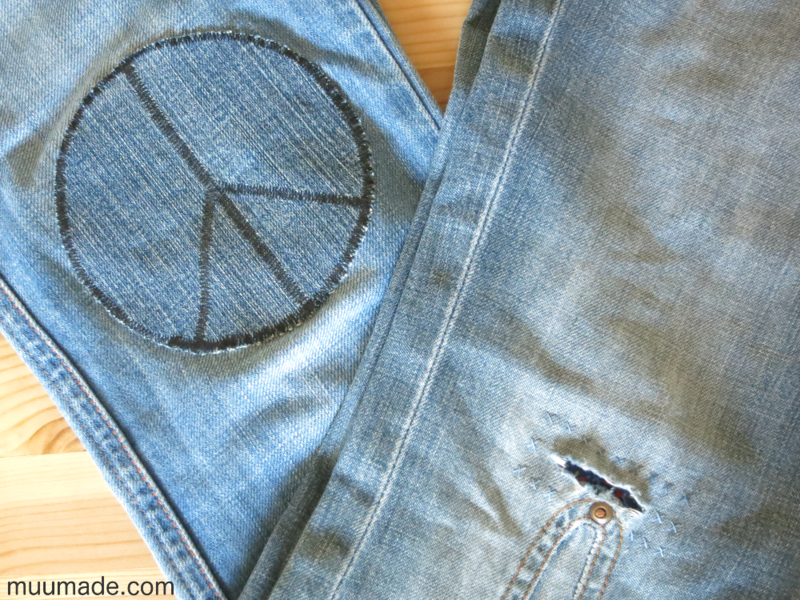 Because I had made a free downloadable peace symbol rhinestone pattern for that post, I decided to take advantage of the same pattern to make a knee patch for my torn jeans. 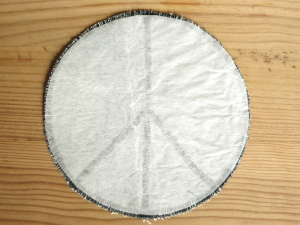 You can download the Muumade_Free_Peace_Symbol_Knee_Patch_Pattern if you wish to use it for one of your jeans or whatever else you would like to patch up. The pattern is 12 cm (14 3/4″) in diameter. I know you can buy iron-on patches, but I prefer to use recyclable materials on hand, such as denim from an old pair of jeans. Plus, it is quite easy to make your own patches. As shown above, I used my sewing machine to make the outlines in zigzag stitches. The stitch width was set at 5 mm (3/8″) and stitch length 0.5 mm (60 stitches per inch, or spi). Next, I cut out a circle out of a sheet of paper-backed fusible web (I use a product called Wonder-Under). This circular piece of web should be slightly smaller than the patch itself, as shown in the photo. 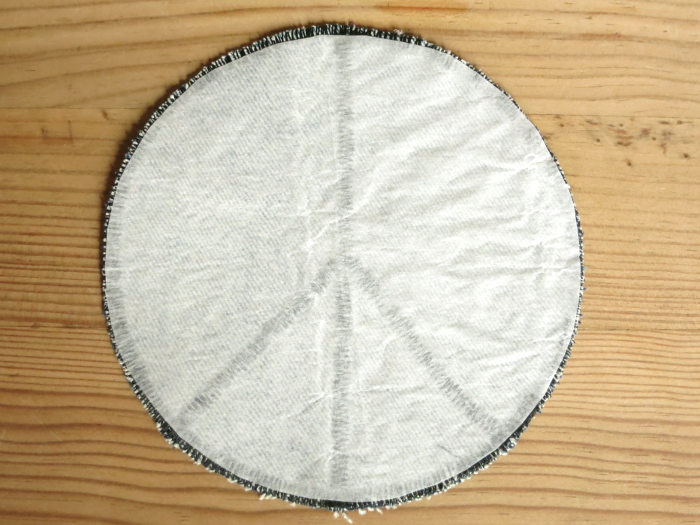 Place this fusible web piece on top of the reverse side of the peace symbol, with the web (rough) side facing down. Then, use your hot iron to fuse the web onto the patch. 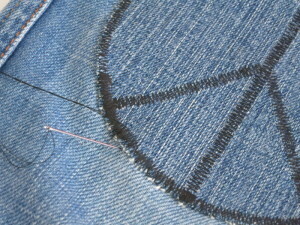 Once the two layers are fused together, peel off the paper backing and place the patch onto the knee area of your jeans. Now iron the knee patch onto your jeans! Lastly, because the knee area of the pants must endure a lot of bending and stretching, I recommend hand-stitching around the patch to reinforce its attachment to the jeans. 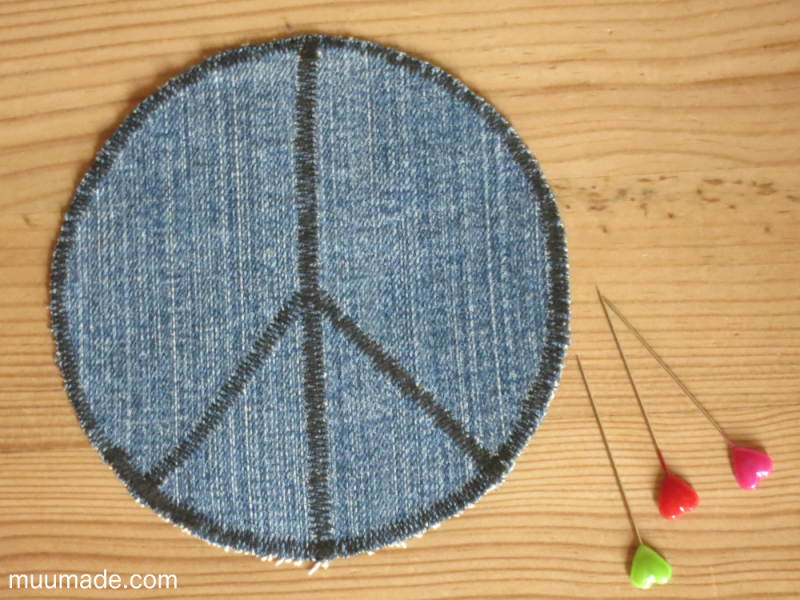 Of course, a patch does not have to be as big as my peace symbol pattern nor does it have to be circular. 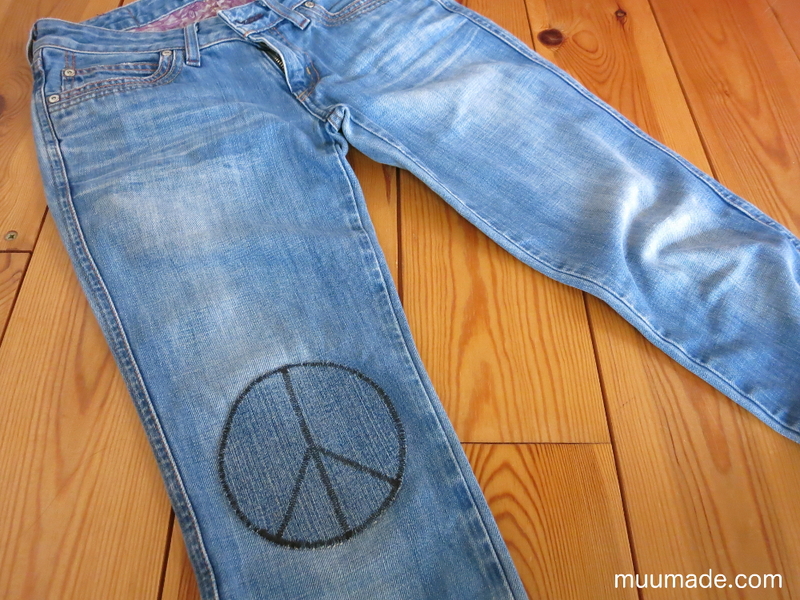 How you patch up the rip depends on the kind of new look you want to give your old jeans. You can trace other shapes, such as cookie cutters, to make smaller patches, for instance. Or, if you prefer to emphasize the ripped look, you can apply a colorful piece of fabric from inside the jeans and attach it on with some decorative stitches.